The mournful wail of a conch shell coming to us from a distance stirs me like nothing else could at this ungodly hour. The eerie sound haunts us as we navigate our way along slippery jungle trails. It's 4:30 a.m. in this ancient port of Ppolé (modern-day Xcaret on the Riviera Maya, Mexico) and as I trudge through the pelting rain I can't help but question my sanity as I'm led to the "Sacred Maya Journey" (Travesía Sagrada Maya), following the path embarked upon by the mighty Maya eons ago. Around me, my companions are silent except for the occasional curses being muttered by one of the photographers as he tries to shelter his expensive camera from the elements. Between the pelting rain, his colorful expletives and the crackle of plastic poncho covering my ears, I try to find some humor in his colorful rant. I'm just as miserable as he is. For more than a 1000 years, people from all over the Maya world made the 17-mile canoe trip from this important trading center to the island of Cuzamil (Maya word for "swallow") to pay homage to Ixchel, goddess of the moon, childbirth and medicine. Their pilgrimage began with a marketplace (Kii'Wik) where objects were traded and offered to the goddess. The currency they used - the cocoa bean - was considered "food of the gods." The night before our journey, we were invited to a recreation of the Kii'Wik in a Maya village at Xcaret, where we bartered and purchased crafts, food and herbs by exchanging our pesos for cacao seeds. 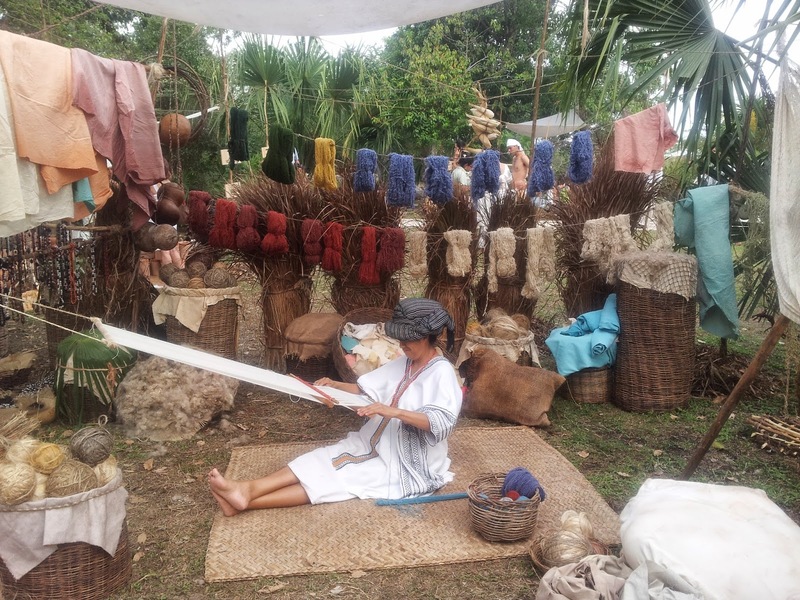 It was like stepping back in time and witnessing an authentic Maya trade event. 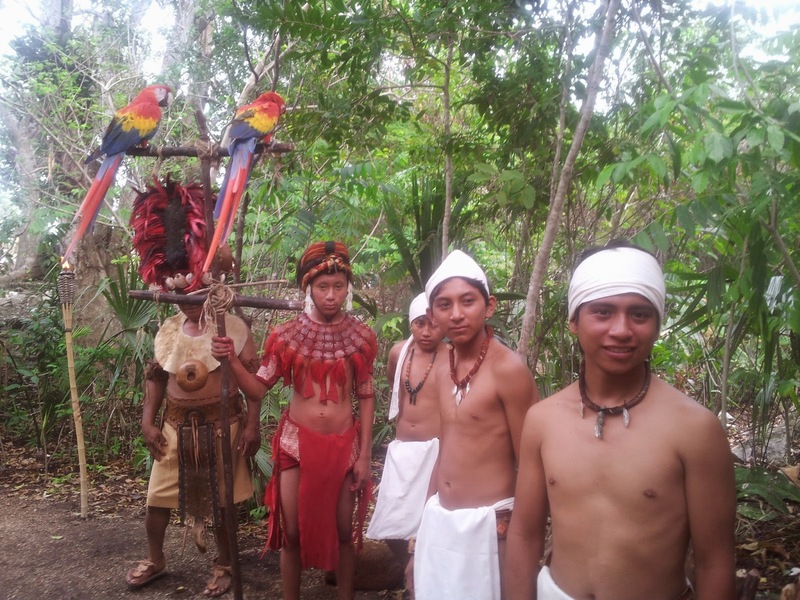 When night fell, a local shaman staged a colorful purification ceremony by the sea devoted Ixchel. 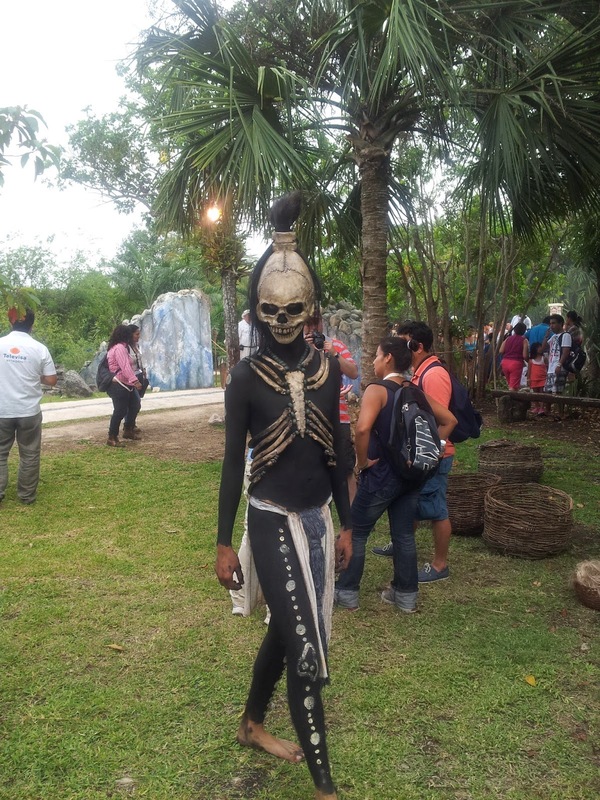 People young and old participated and it was definitely "fiesta time" in the Maya world. Now, as we near the beach in the early light, I can sense the excitement as the wail of the conch draws us closer and the pungent odor of copal incense reaches us. The pounding of the surf and the dark menacing clouds rolling in do nothing to dampen my enthusiasm of being a part of this mystical celebration. Maya youth prepare for the "fiesta"
Almost on cue, the clouds part, the rain stops and the sky lightens, revealing a row of roughly hewn canoes lining the shore, perfectly poised for departure. 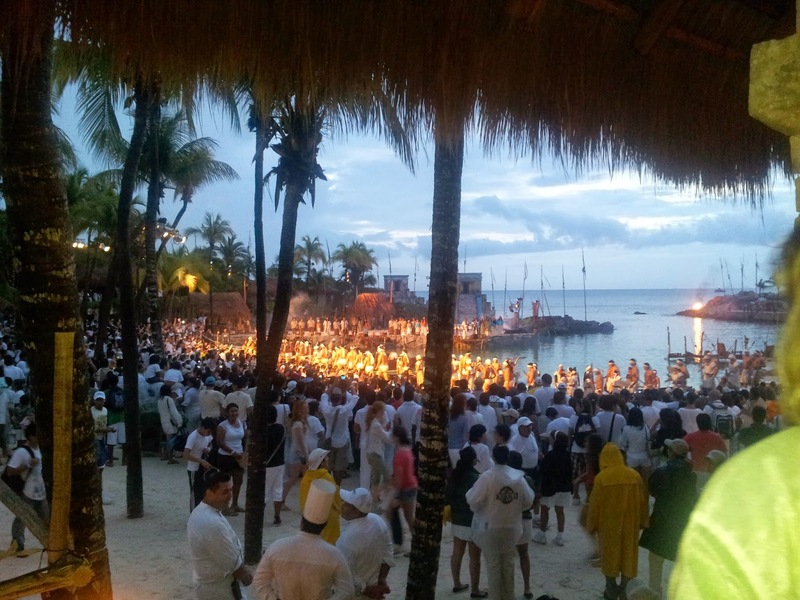 Around 5:30 a.m. the canoeros (rowers) clad largely in traditional white Maya garments emerge in a torch-lit procession. As a loud roar bursts from the crowd, some 300 men and women who have trained for six months - both physically and spiritually for this journey - climb into the 28 waiting canoes. Rowers are from not only Mexico, but from all over the world. Participation is voluntary with the only requirement stipulating that they be in excellent physical condition to endure the rigorous journey. After a final blessing from the shaman and the release of dozens of colorful macaws, they head off to sea, accompanied by dolphins - seemingly appearing out of nowhere - along with two Mexican Navy vessels and a host of private boats - including the one I am sailing in. We accompany them for about an hour, and then bidding them Godspeed with a flourish of hand gestures and shouts, we head back to shore. It seems that Ixchel is with them today as the sea becomes calm and they reach their sacred island in record time: 3 hours 50 minutes. 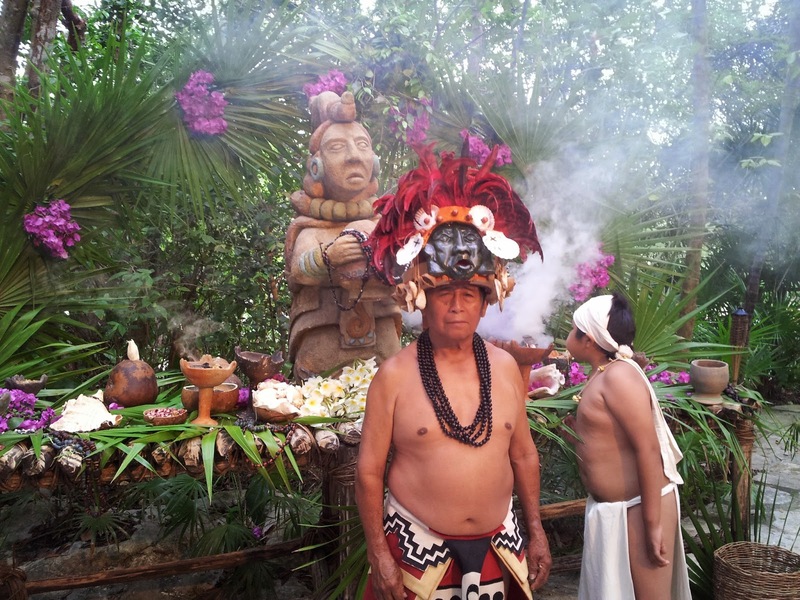 When they reach Cozumel, they are greeted by a cast of thousands and are allowed a well- earned rest, until 8 p.m. when they consult with the Oracle of Ixchel and take part in a Fire Ceremony at Chankanaab Park. The next day, at 5:30 a.m., the canoeros bid farewell to Cozumel and make the return crossing to the mainland at Playa del Carmen, where they are greeted with yet more fanfare. I don't know if the date for the Travesia Sagrada has been yet for 2015, but I make a mental note to return. I can't wait for my date with the goddess Ixchel because I have it on good authority that she throws quite a party. This looks incredible! I'm definitely not an early riser, but some of the best experiences I've had while traveling have required getting up very early. I love your photos! I don't like getting up that early, either but this was definitely worth the experience. Thanks so much for checking in. My pleasure. I'll check your site out...thank you! It was my pleasure. You should try to do it sometime. It's definitely a memorable experience.